During my formative years, LEGO meant horseback riding and windsurfing. (And also, teeth marks on any pieces that were difficult to take apart.) So when I stumbled upon Andrew Tate‘s most recent build today, I was hit with a pleasant wave of nostalgia. 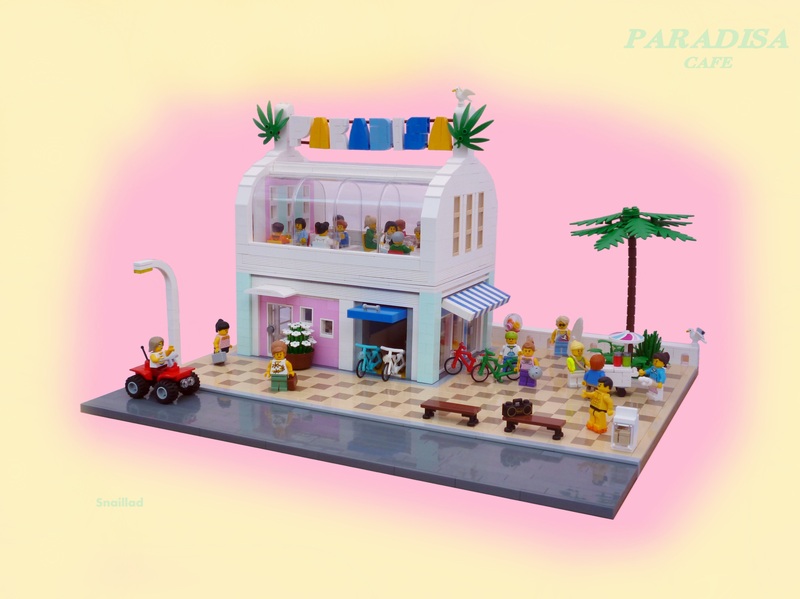 Even without the terrific lettering across the roof of the cafe, this build screams “Classic Paradisa” with its curved windows, muted color palette, and diverse minifig activity. Where else would a speedo-wearing, boombox-toting, roller-skating minifig fit in so perfectly? Andrew explained that this build was inspired by Sand Dollar Cafe and Breezeway Cafe. Hopefully, his awesome scene will inspire other builders to try their hand at the Classic Paradisa theme too. Be sure to check out all of Andrew’s excellent builds here.